We do this one a couple times a year but my favourite is the one we go in December, we do it two weeks before christmas, we go about 2 hours away, we stay at a fancy hotel, we eat delicious food, we have a good time, sometimes we hang out with friends, sometimes we just hang out with each other, we watch TV, go to bed late, sleep late, go to brunch and then go shopping. We have a great time, it is one of the highlights of my year. I love when we are able to get away! Sounds like a great idea! We just made an 11 hour trip to TN for my sister's memorial service and we stayed at a sweet bed and breakfast. We really enjoyed time together though the occasion was sad. That is a good idea! Thank you! I love that you guys have a yearly date night tradition. I need to schedule more date nights!! That would be so much fun! I miss living close enough to grandmas to make things like this happen. Today we celebrated by enjoying a special treat at an eatery we had not been to before. It was fun and some good memories were made. 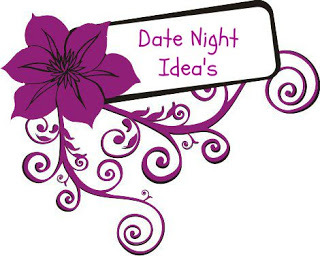 This is such a fun idea for a date night! My hubby and I will have to try it sometime!